Are you a fashion startup entrepreneur, who’s spending your hard-earned money on fancy websites/blogs or Facebook marketing? Have you ever considered Instagram for marketing your business? Wondering, what to do with pictures and hashtags? 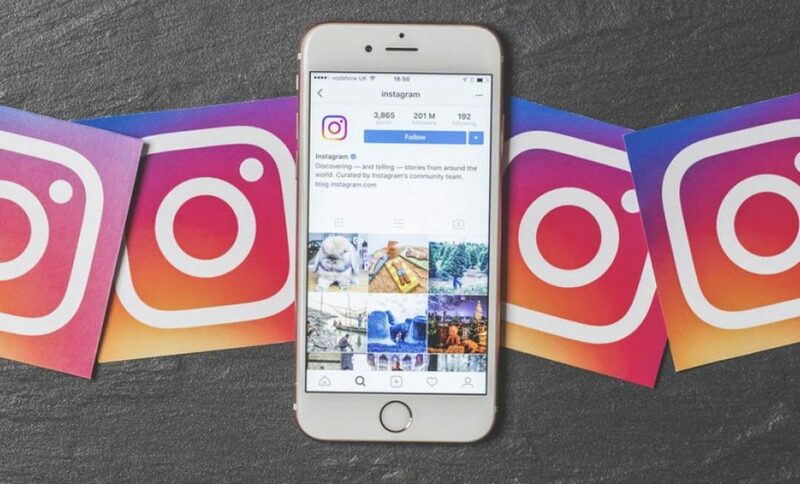 But do you know that majority of established business tycoons are already using Instagram as an effective marketing tool, right now, when you’re reading this? Well, if you’re thinking of logging into Instagram, I recommend reading this post till the end to know what to do and how to do it. Although, using Instagram as a marketing tool isn’t new, it’s underrated for sure. It’s interesting to know that the average Instagram post has the ability to generate more than 50 times the engagement than the most popular social media platforms i.e. Facebook and Twitter. Yes, you read it right. Instagram has become a driving marketing tool for the start-up business recently. With its over 300 million active users, it’s one of the most effective social platforms now, that’s frequently used for marketing campaigns. A picture is worth a thousand words. People are naturally drawn to this medium more than others. Instagram is fun to use, you can interact with your audience through visual posts, GIFs, memes, etc. and you can experiment with your posts to capture the attention of your target market effectively and efficiently. Even the gurus and pros of the fashion industry like Louis Vuitton to Gucci are actively using Instagram to capture their respective market share. Sounds interesting? It isn’t a big deal either! All you need is the right plan and interesting ideas to get on board. We can vouch for your success. Well, to make it easy for you, we’ve come up with 6 simple yet interesting ideas that will turn your fashion startup into a brand. Hashtagging on Instagram is the simplest way to create engagement with your target audience. It gives your posts an instant boost to reach the masses within a few seconds – All you need to do is come up with a hashtag that is relevant to your customers and business. Similarly, using popular hashtags allows you to connect with your prospective customers, retailers, designers and collaborators. It also helps your posts appear in the search bar. 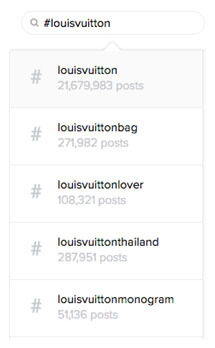 Here’s an example of Louis Vuitton using hashtags. Everyone loves stories. People are interested in knowing the story behind your business. It’s always entertaining to read how a business idea came to be and what led to the initiation of the business. What were the challenges that came along but didn’t stop the inevitable from happening? So why not share your interesting journey with your audience. Make a 5 to 8 post stories about your business and share one post at a time with your audience. Build anticipation in your audience, so they keep following you to know more about you. Open a small window for your customer and create a bond with them. Jenny Walton – Fashion Director at The Sartorialist shares her story via pictures to create engagement among her followers. Giveaways or interesting competitions always engage the audience, it’s cool to participate in the competition to win something. Why not think outside of the box to create entertaining and engaging competitions and giveaways? Offer them a giveaway that represents your business. Give prizes for the-best-outfit-in-my-closet or what-you-want-to-wear-on-your-wedding-day. Ask followers to post relevant pictures to win discounts or prizes. Print their pictures on shirts or scarfs or anything that your brand is about. Give them a token of appreciation for participating in the contest. 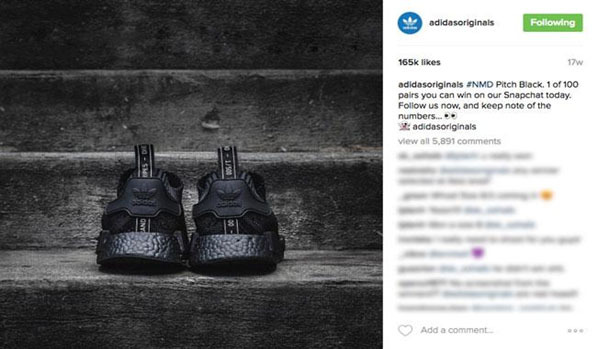 Adidas came up with a marvelous idea when they ran a contest on Instagram to launch their NMD Pitch Black sneakers. They hid a number in their Snapchat story and promoted it through their Instagram account. Users could find the number and win a pair of their latest sneakers. They engaged their customers with a contest, which was fun and different. We remember those brands who create engaging competitions. After all, who doesn’t want to win something? I’ll share your post a hundred times if you promise to give me an alluring discount on my favorite products on your page! Collaborating for a good cause is the best strategy to get your audience’s attention. All of us empathize with people who are suffering. Let your brand raise its voice for humanity. Start supporting a cause you believe in, maybe education for kids, or shelter for the poor or food and clothes for the underprivileged, it’s even better if your business goals and operations are aligned with your cause. For instance, Raven + Lily is a fashion brand that employs over 1500 women from underdeveloped countries around the world to make accessories and clothing for their brand. Branding with a good cause gives you brand recognition as well as customers’ appreciation. It’s exciting initially to get all active on the Instagram and start posting a lot of things at once. But, Hold on! Don’t OVERDO it. It’s totally okay not to post every day. That’s how brands work, they post once in awhile but the content is worthwhile and people remember it. By posting everything and every other second of the day you’ll over saturate your followers to the extent that they might end up unfollowing you for good. So, the idea is to never post to the extent that it starts to annoy your followers. Though Instagram isn’t bound to word count, that doesn’t mean that you need to write a novel about your fashion apparel when captioning your picture. Taking inspiration (stealing and recycling an idea maybe) from someone is actually a good idea. Follow your competitors’ activities on Instagram, it’s smart to keep a check on your rivals’ next move. Take inspiration from renowned campaigns and brands, twist the ideas and come up with something even better, make it more entertaining, engaging and relevant to your target audience. Follow the brands and personalities you admire, and keep interacting with them to build connections. If they endorse your product on their page, you will enjoy the benefits of their popularity among their followers. It doesn’t matter if you’re a busy entrepreneur, a smartphone or tablet are all you need to continuously grow your audience on social channels and you can find different apps such as AirG lifestyle chat that connect people. Choosing the right apps and platforms will make all the difference to your success. But remember that you won’t get the desired outcomes at once. It is constant hard work, that pays off with time. And yes, real success comes to those, who’re consistent, plan in advance, and are patient and dedicated. We wish you all the best. Audrey Throne is a mother and a professional blogger by choice. She has completed her masters in English literature from university of Birmingham. As a blogger she wrote quite a few posts on health, technology as well as management. Currently, she is associated with Airg team for development work. Check out her firms performance reviews.